Horde survival games will always have a special place in my heart. A warm little fuzzy area right next to isometric RPGs and Super Mario 64. They are easy to learn but hard to master, always up for a quickie and nearly always absurdly fun. However, they always seem relegated to a sideshow or a minigame or a single mission or quest. From Call of Duty to Dawn of War, games of all shapes and sizes have used wave-based survival modes to squeeze out a bunch more content for only a little more effort, utilizing already-existing assets in a new way. But Killing Floor 2 from Tripwire Interactive spurns these ideas and places the destruction of shambling hordes firmly in the spot light. 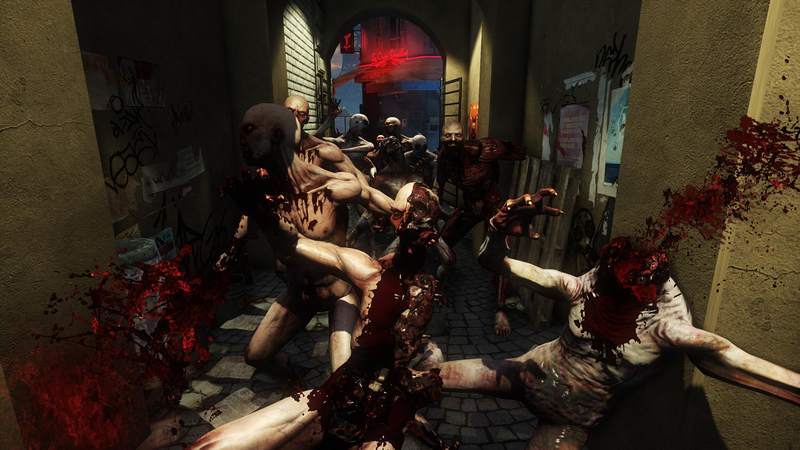 Killing Floor 1 was a massive hit, creating a cult following crying out for another opportunity to spend their dosh. Tripwire gave it to them in the sequel, with better graphics, more skills, more enemies and most of all more weapons, maps and even a little more story. The base game is the same: get together with some mates and blast away at the nasties until a boss shows up. How you choose to blast away is very much up to you, whether it is with sharpened shovels and knives or RPGs and dynamite, Killing Floor 2 has a little bit of everything for everybody. The graphics are solid, the animations are brilliant, the gore is wonderfully brutal and it is simple to pick up even for complete novices. However, there are some small issues that need to be addressed. Blasting the various enemies that throw themselves at you, while fun, can get repetitive even after trying out all the various perks and classes. There is only one boss at the moment, so you know exactly what you are going up against. There are plenty of maps, but they really all amount to the same tactics: get together in an open area with chokepoints and nail anything that comes through it groaning or shrieking. These issues are not likely to stick around, thankfully. Tripwire, while stating that KF2 is NOT an early access game, consistently updates both the game and the community with new features, new perks, new maps, and also allows the community to share maps and other various content. It’s a very open game, and the simple (current) gameplay is diversified in new places to defend and rush around in. New modes are going to open up, with new bosses and new classes, so the best is still yet to come. There are very few bugs to speak of, and those that are there do very little to affect the usual player. All in all, Killing Floor 2 is a worthy successor and an absolute blast to play. However, don’t expect to be able to play for hours upon hours without getting bored. The content that is there is excellent, even if it is a little bare at the moment, but as stated, there is still plenty more to come. This game gets an official score of RAD from us here at Rad Shite Gaming.